in four separate stories of graduated size with a separate balcony around each of the three upper levels, rising from a walled compound with a pailou gateway at the front, the first storey of double-height surmounted by a hipped roof on all four sides supported by double-arm duogong brackets at the front and with circular ridge tiles ornamenting the edge, the corners embellished with large upturned petal-shaped ornaments, the three upper stories each with a matching roof above twin latticework shutters over a pair of windows at the front, flanking a moulded panel of chevron motifs, and with human figures leaning out of small windows on either side, the high-walled balconies also decorated to match with panels of chevron-pattern and parallel lines, the top storey with a moulded taotie mask and ring on the front and with a peaked roof rising to a central ridge decorated with large petal-ornaments at either end, the brick red pottery covered with a thick green glaze which has degraded to a fine silvery iridescence all over. 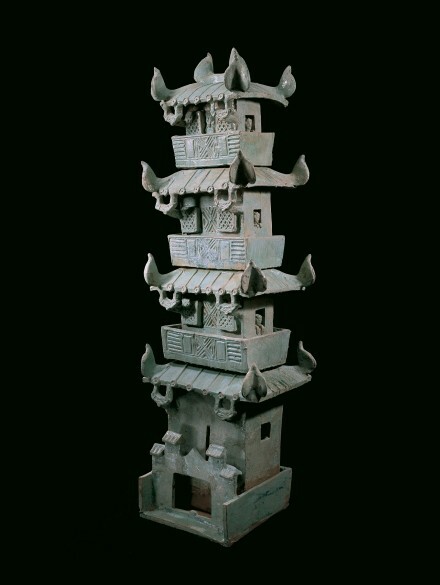 A similarly modelled tower of smaller size, excavated in 1959 from Diaoqiao, Tongguan, Shaanxi province, also with petal-shaped corner ornaments and with figures at the side windows, is illustrated in Wenwu, 1961, No. 1, p. 61, no. 23, and is illustrated again by Takashi Okazaki in Arts of China: Neolithic Cultures to the T'ang Dynasty, Recent Discoveries, Tokyo 1968, p. 174, pl. 317 (a,b).